Wash the kohlrabis, remove the leaves, remove the tough parts and stem. Peel the thick skin of larger kohlrabis, if necessary. Place the whole kohlrabis on a baking tray lined with baking paper, drizzle with oil and season. Bake/roast for approx. 1 1/2 hrs. in the centre of an oven preheated to 200°C. 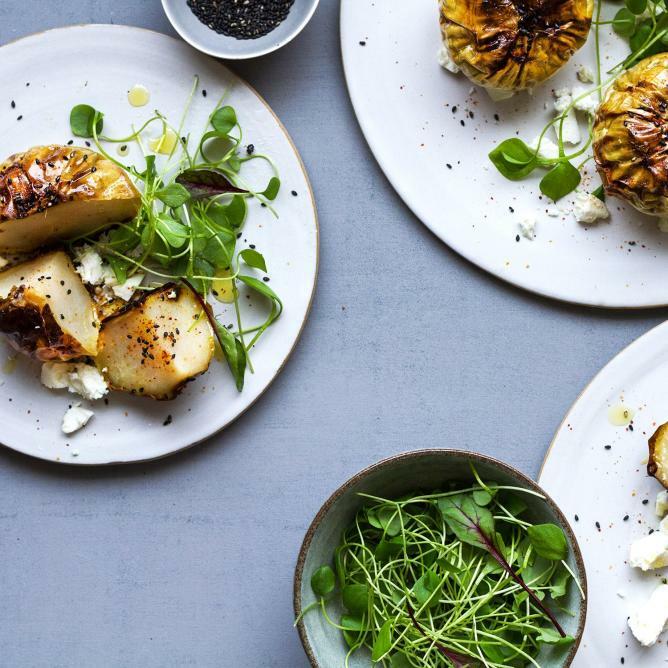 Cut the kohlrabis into quarters, drizzle with the oil and lemon juice, sprinkle with the sesame seeds and chilli powder, top with the feta. Serve with purslane or lettuce.